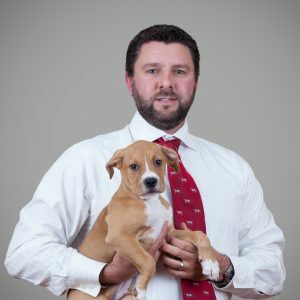 Dr. Jacobsen is currently managing partner of Oswego Animal Hospital, after first joining the Kremer Veterinary Services team in 1998 as a kennel worker. His primary areas of interest include small animal surgery, orthopedic surgery and soft tissue surgery. Dr. Jacobsen received his doctorate in veterinary medicine from Ross University in 2004 after completing his undergraduate work in animal science at the University of Illinois in 2000. He is a member of the Illinois State Veterinary Medical Association (ISVMA), the Chicago Veterinary Medical Association (CVMA), and the American Veterinary Medical Association (AVMA). Additionally, he has taken both basic and advanced courses in orthopedics. In his free time, Dr. Jacobsen enjoys flying planes, hunting, fishing, and spending time with his wife, Donna and their daughter, Larkin and son Reid. Three dogs, Libby, Finnegan and Marley; a guinea pig named Snickers; and a fish tank are also included in the Jacobsen family.